Owning a mature saltwater fish tank was a great experience. The tank was a joy to watch as the fish would swim around and occasionally fight for territory. It was comical to see the clown fish dart aggressively at other fish that swam past his anemone. As the aquarium lights went out in the evening, the tank began to teem with indescribable life forms that would crawl about and many were almost microscopic. Moving from Southern California to Arizona was a tough decision. I had to sell my beloved fishy friends and various inhabitants due to the risks involved in transporting them. Transferring every coral and fish would be a challenge. The fish and corals would need to be kept in buckets of water with a heater maintaining a constant temperature. 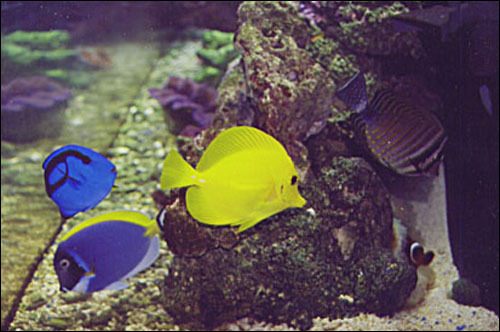 Saltwater fish are sensitive to fluctuations in temperature and therefore, react poorly with sickness that can lead to death. The time and preparation involved would be immense and the need for a large vehicle to accommodate everything would be a necessity. Overall, set up of a fish tank in Arizona is more costly and access to quality fish is not as good since they are shipped from overseas to Los Angeles, then to Arizona which is more travel for an already stressed out fish. The fish may be more apt to get sick as well. The buying power in California is much better and the Salt Water Fish stores in Arizona charge more for the fish and corals due to the additional shipping to get them to Arizona and the higher mortality rate. So if you reside near the coastal waters where the shipments are delivered, you are more likely to get better prices. When setting up any saltwater fish tank, it needs to cycle for 4-6 weeks before fish can be added as the water chemistry is unstable and the fish will die. Water tests should be conducted weekly to monitor levels of Ph, Chlorine, Ammonia, Nitrite, and Kh later calcium if you plan to have corals. Temperature should be maintained using a heater ranging from 78-82 degrees. Once your water chemistry is good you can introduce the fish. Damsels are recommended since they are the hardiest fish and reasonably priced. If the fish are faring well for a few weeks without any noticeable illness, then you can introduce more expensive varieties one at a time. Fish need time to adjust so let them get used to their new environment before adding too many fish at once. Saltwater tanks require regular maintenance. Water changes should be made at 25% of the total water volume at least 3 times a month or smaller changes once a week. You cannot add the salt mixture directly into the tank as this will create higher salt content and kill the fish. You will need a large Rubbermaid trash container to store the water in and add the salt mixture as directed. Keep water movement flowing with a bubbler for a few days to allow the mix to dissolve. A heater should be inserted as well to maintain temperature before you add the mixture into the tank. 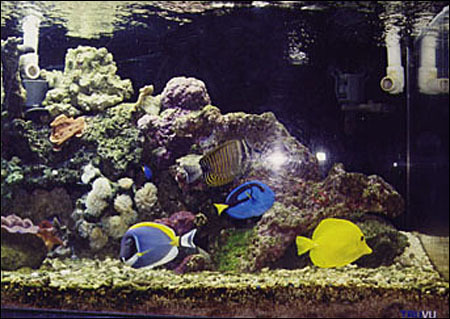 Corals require more care and equipment than fish. Compact florescent lights or metal halides should be underneath the tanks canopy to give the corals artificial sunlight, which is very similar to true sunlight. Fans on both sides of the tank's canopy need to blow air across the waters surface to keep the water temperature from getting too hot. Always check your thermometer. Corals also require calcium to thrive and it must be tested regularly to ensure proper levels. The set-up of a tank itself would also require a chiller in warmer climates. A chiller cools down the temperature of the water since the compact florescent lights heat it up. With Arizona's temperatures reaching 90 degrees or more it is far more difficult to maintain cooler water temperatures unless the AC is constantly running to ensure cool ambient temperatures. It's best to have a chiller just in case the AC fails. Finally, if you own a salt fish tank now and would like to move to a warm climate think twice if you want to take it with you. If you have always wanted to own a salt tank and are willing to do the work to maintain it and keep the fish healthy, then you will be rewarded with an experience to remember for a lifetime.